Victoria Schappacher was very successful showing her animals at the Fayette County Fair. “Crack!” I looked down and found my show stick dangling in two pieces. This is a showman’s worst nightmare. I had just entered my freshman year Dairy Feeder Showmanship class. In that moment, my mind was frantically trying to fix the situation. This was a time in my life that no one could step in to help. Ready or not, I had to fix this situation and fast. My first thought was to leave the show ring immediately, but what could I learn by just leaving? As they say, the show must go on, and that it did. I urgently tried to find a solution. The good thing was that I was the last one to enter into the show ring, so I had a few minutes before the judge would give me a good look. My feeder calf “Gus” was not the most cooperative calf in the world, which did not make my task any easier. It was the middle week of July; therefore, it was 90 degrees outside, and it felt like 120 degrees inside the show ring. Every time I would get Gus into the right position, the judge would make me move and then I would have to reset the feet. The show halter was slipping out of my hand as the slobber was coming out of Gus’ mouth. I could feel how badly I was doing and was more than ready for this class to be over. After about 45 minutes, the judge finally began to wind things down. I wasn’t expecting to place. I was just happy that I did the best I could with what I had. The judge started to place the class, and from where I was standing I either had first place or last place. The answer was clear in my mind. I was getting ready to shake the winner’s hand, when my thoughts were interrupted as the judge picked up the microphone. As he started describing the winner of the class, I realized he was talking about me. I couldn’t believe that he placed me in first place. It was in this moment that I realized it is not the trophy and blue ribbon that makes winning feel so good, but rather the hard work, effort, sweat, slobber, and many lessons learned along the way. At the time, I did not realize it, but my past experiences in my 4-H career had prepared me for a moment like this all along. For example, showing dairy heifers for seven years had taught me how to get those feet set up quickly and without a show stick. Finishing a clothing project the night before judging had taught me how to work under pressure and to handle the stress of time. Forgetting a key ingredient in my goat milk soap demonstration at the county contest taught me that, even without the right ingredients, you can still work through the situation. All of these and so many other lessons that I have learned in 4-H have not only prepared me for that showmanship class, but also for many years of my life to come. I am grateful for the lessons that 4-H has taught me and I look forward to learning many more lessons as I continue my 4-H career. I will be thankful forever for the program and experiences that have helped to shape me into the person I am today. 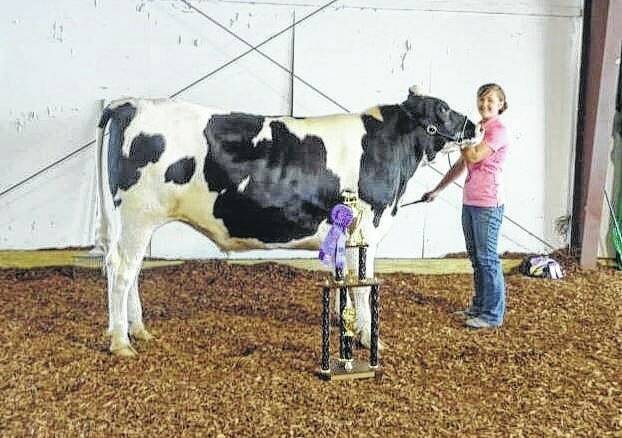 https://www.recordherald.com/wp-content/uploads/sites/27/2017/02/web1_Schappacher.jpgVictoria Schappacher was very successful showing her animals at the Fayette County Fair.